Hillary Clinton Duh? No Duh! Hillary Clinton’s condescending utterances have received so much gratuitous applause from Liberals over the years that it is now fatiguing to muster dissent. What the nagging shrew lacks in substance she compensates for with longevity…and a seemingly endless pool of financial backing. No matter how much you think you’ve seen the last of her, she flares up like ringworm jock itch at the most inopportune times. She just won’t go away. 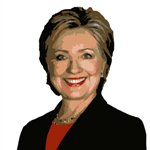 How is it, that in the year 2015, we must endure another bout of Hillary? It seems this has been going on forever. Back in the year 1997, for example, we recall being greatly belabored by an intellectual Progressive’s reverences for Ms. Clinton. The Great Thinker placed a great deal of importance on her dim intellect…that she would lead us into the Promised Land. We don’t know whatever happened to this happy fellow. Perhaps he’s still advancing the cause of democracy to better suit his existence at the expense of his friends and neighbors. Regardless, Hillary’s still here. We’ve learned to make the best of it. For instance, rather than getting agitated when seeing Hillary’s smug mug on the nightly news we marvel at what a fright her face has become. We can’t quite tell what in the world has happened. But whatever it is…the ugliness is cockadoodle awful. One of the more endearing things about national politics is presidential elections. Although hardly a soul in this day and age still takes elections serious, they are not without merit. In fact, they are not all bad. For what better opportunity is there to point and laugh at the buffoons as they parade across the walk? The show we’re greeted with is more amusing than anything a Hollywood screen writer could conjure up. Clowns, cads, and cons…tripping over each other for your vote. Taking notice of the many absurdities a presidential election brings is both the joy and misery of the objective observer. One moment you’re doubled over with laughter. The next you’re doubled over expelling your lunch with disgust. With the 2016 presidential election ramping up there’s been no shortage of scoundrels and drivel dribblers to entertain us. Rick Perry. Marco Rubio. Jeb Bush. Indeed, these are funny fellows. But, head and shoulders above all, Hillary Clinton takes the cake. Holy cow! Hardly a day goes by that she isn’t wafting large emissions of sulfurous hocus-pocus while masquerading as a public do-gooder. In addition to the suspect money dealings, Hillary’s on the job failings as Secretary of State, which have crystalized down to her handling of the 2012 Benghazi attack, are massive. Not only did she conduct official business as Secretary of State on a personal server. But when asked to turn over her server to the State Department inspector general for an independent review, she wiped it clean and permanently deleted all emails. The real grating thing about Hillary in all this is that she thinks she is much smarter than she is. This would be fine if it were true. But it isn’t. She’s fair to middling at best. Her latest attempt to pull the wool over was the recent delivery of her emails…the ones she deleted from her server. She didn’t deliver electronic files. She delivered printed hard copies totaling 55,000 pages of email and attachments. The State Department then had to scan and return the hard copies to electronic format. This took five weeks and more than 2,400 man-hours of work – at the taxpayer expense. Naturally, Hillary thinks we’re all morons. But even our slow minds can connect the dots. She set up her personal server to bypass the Freedom of Information Act. After she got called out for this, she printed select hard copies, wiped the server and destroyed everything she didn’t want the public to see. After all, email is, by definition, electronic. This entry was posted in MN Gordon, Politics and tagged 2016 presidential election, benghazi attack, email, freedon of information act, hillary clinton, state department. Bookmark the permalink.